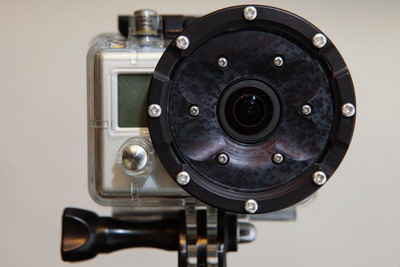 I few years ago I bought a GoPro HD Hero and thought that using it under water while diving would be nice. My first dive was a disappointment because of the focus-problem. It the time, all solutions was flawed in some way, most often black corners but also poor quality and made of plastic witch was easily scratched while diving and if the camera was hanging on you dive equipment or in a bag. I decided to make one my self. After many prototypes with everything from a vacuum formed dome to a flat polycarbonate disc and finally to a hardened glass disc mounted on a anodized port I finally got something that works very well. When I first started there was almost no other third party ports available, but now there are many to choose from including GoPro's own. Because of the glass port it will not scratch if you leave it hanging from you BCD and it bumps in to your other equipment. It's also easy to take it apart and clean.